Just how widespread is alternative polyadenylation in plants? This is the question I think about a lot, and one I spent a some time on in a recent minireview. The answer is, in a nutshell, very. One of the things I had to do for this review was try and make sense out of the different approaches that have been described recently for studying alternative poly(A) site choice in plants. One of these – the use of high-throughput sequencing to sequence cDNA tags that query the exact mRNA-poly(A) junction – has been discussed previously, in a general sense and in terms of a study of poly(A) site choice in plants. In the latter study, it was determined that about 70% of plant genes possess at least two poly(A) sites. … for a recent paper. And a short summary as well. I know it seems like a long time since my last entry here, and it has been. This is what happens when one makes promises to one’s self. Back in late May, I was looking forward to adding an entry describing a new paper that was (in my optimistic eyes) on the verge of being accepted, and I told myself that this entry would be the next one on this blog. As one might imagine, reality stepped in, and acceptance of the paper was delayed by quite awhile. But this changed recently, and on Nov. 6 the study was finally published online. (Coincidence with the outcome of the Presidential election? Who knows.) So I can pick up where I left off several months ago. Two different lines of research led to the current study. My lab has been studying a particular subunit of the plant polyadenylation complex – CPSF30 – for some time. A list of our publications on this protein is at the end of this essay. What was of particular interest were two findings. One of these was that the Arabidopsis CPSF30 could bind calmodulin, and that the RNA-binding activity of the protein was inhibited by calmodulin in a calcium-dependent fashion. The second finding (discussed previously on this blog) was that two of the cysteine residues in one of the zinc finger motifs of the protein were engaged in a disulfide linkage; reduction of this bond inhibits another biochemical activity of the protein (this finding was described in Addepalli and Hunt, 2008). What is interesting about these findings is that these mechanisms or pathways (calmodulin and a reducible disulfide bond, respectively) that connect with cellular “sensory” pathways both inhibit the plant CPSF30. Putting things simply, these studies raise the possibility that CPSF30, and thus polyadenylation, may be directly regulated by cellular signaling systems in plants. The second line of research may be traced to a fortuitous finding in Deane’ Falcone’s laboratory. 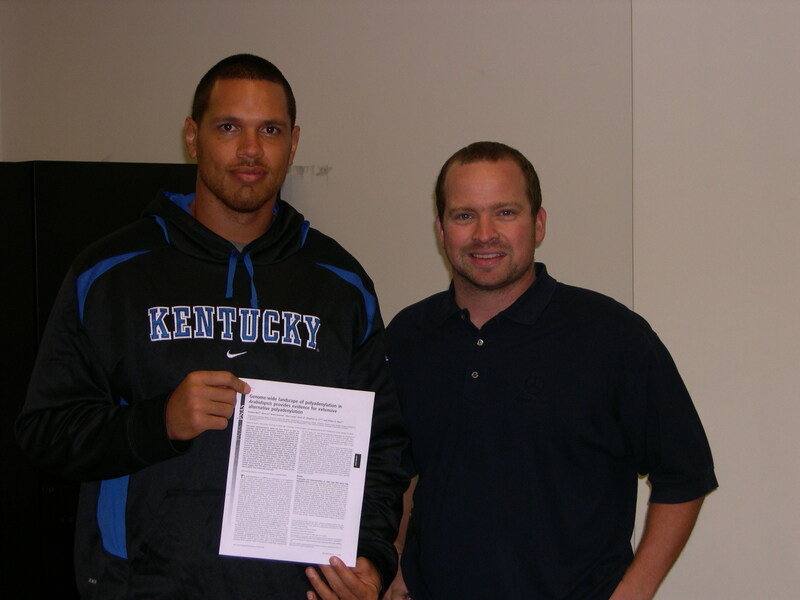 (Deane was in the Department of Agronomy here at the University of Kentucky when he made this discovery; he since moved on to the Dept. of Biological Sciences at UMass Lowell.) This finding was described in a 2008 paper in PLoS ONE; briefly, Deane found that an Arabidopsis mutant with a T-DNA insertion in the gene (OXT6) that encodes CPSF30 had a greater tolerance than the wild-type to different sorts of oxidative stresses. The inhibitory effects of calmodulin and sulfhydryl reagents (that reduce the disulfide linkage mentioned above) on CPSF30 in vitro raise the possibility that activation of calmodulin in the cell, or altering the redox status of the cell, might inhibit CPSF30 in vivo. This could lead to some sort of change in polyadenylation in the cell, change that would be manifest in altered growth or responses (such as, say, to oxidative stress). Thus, an obvious question to ask is – how does the inhibition of CPSF30 affect polyadenylation? The availability of the oxt6 mutant allowed us to ask this question. Briefly, we reasoned that mutational elimination of CPSF30 might approximate the inhibition of the protein; thus, a characterization of the oxt6 mutant should provide insight into the consequences of inhibition of CPSF30 via calmodulin or redox mechanisms. To tackle this, we turned to the high-throughput poly(A) site methodology that we developed and described in 2011, using the approach to assess differences in poly(A) site choice between the mutant and wild-type. Basically, we used the high throughput approach to determine poly(A) sites for most expressed genes in the wild-type and oxt6 mutant. This is the study that was recently published. This essay is follow-up to a previous entry, the second in what may become a series of unpublished but very real results. For those of you who have downloaded and read Kevin’s thesis, you will have noticed that much effort was expended in characterizing an unusual inhibitor of poly(A) polymerase. Kevin started in my lab in the days before the Arabidopsis genome was completed; in those days, my lab was committed to pursuing biochemical approaches to understand polyadenylation. 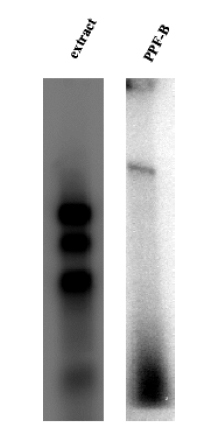 Unfortunately, it was not possible to observed authentic processing and polyadenylation activity in a plant-derived nuclear extract. (The reasons for this remain unknown, to this day. Quinn Li’s group has succeeded in detecting processing in an Arabidopsis extract, but even in this case the processed RNAs are not polyadenylated by endogenous poly(A) polymerase.) However, it had been reported, in the mammalian and yeast literature, that one or more polyadenylation factor subcomplexes could inhibit the non-specific activity of poly(A) polymerase. The latter is an enzyme that can be detected, assayed, and purified from plant sources. Thus, it made sense to use the inhibition of this activity as a sort of assay for other polyadenylation factors. This was where Kevin started. Sure enough, he was able to identify a very effective inhibitor of poly(A) polymerase. After ruling out trivial explanations (it wasn’t a nuclease or protease), he pressed on to purify the inhibitor, with the goal of obtaining DNA clones that encoded the inhibitor (or its subunits). One of the components that copurified with the inhibitor was an interesting variant of histone H1. (The inhibitor was called PPF-B.) Because U1 snRNP was known at the time to inhibit poly(A) polymerase, Kevin also did some northerns that showed that the inhibitor was devoid of U1 snRNA. The unknown RNA in the PPF-B preparation was clearly larger than the stable RNAs seen in nuclear extracts (“extract” in the figure), and to this date has not been identified. There’s more to this story in his thesis. What remains curious (and, as is the case with the connection with H1, incites the overactive imagination) is the association of a small RNA (but NOT an siRNA or miRNA, since it is far too large) with poly(A) polymerase inhibitory activity. Kevin did not follow-up on this, since the “end of the tunnel” for this project seemed years away. So he instead turned his attention to the Arabidopsis ortholog of Fip1p, an effort that resulted in a nice thesis chapter and an interesting JBC paper. The large RNA associated with the inhibitor still lurks in the back of my mind, but so far no obvious explanation has jumped out of the literature. Maybe someone reading this will be inspired to …. No, this post is not about the fear that our favorite subject strikes in the minds of students who are struggling with concepts and principles of gene expression. Rather, it’s about an interesting story that helps to illustrate (as if this is needed) the relevance of polyadenylation (and specifically poly(A) site choice) to medical science. Mention has been made on this blog of a correlation between poly(A) site choice and cancer. Many meta-analyses and high throughput sequencing studies have also noted a related phenomenon – a great deal of alternative polyadenylation that seems to be specific for neural cells and tissues. One example of this is recalled in a recent paper that suggests a link between an alteration in alternative polyadenylation and aspects of memory and anxiety in mammals (including humans). What is a linker histone doing there? By way of introducing this short entry: as is probably true for most blogs that discuss various and sundry aspects of science, I have tended to focus on reviews or peer-reviewed research papers – “the literature”. There is, however, a whole lot more to the lab than these finished and polished products. What I want to do with this entry is a bit different. Instead of talking about a complete study, I thought I would talk (briefly) about some results from my lab that, for various reasons, never found their way into print. Ideally, someone will read one of these essays and speak up, telling me just what is going on and how it fits in with other data or models. The following is one such example, a result that is curious and perplexing. I chose it because it comes with pretty pictures, and because it is a segue for another essay that I will post in the future. The data is from a thesis of a student of mine – Kevin Forbes. The experiment itself is 7-10 years old (I have forgotten just when this study was done), and I made sure that Kevin would be OK with this before I posted anything. The bi-annual Cold Spring Harbor Laboratory Meeting on Eukaryotic mRNA Processing is one that I try to attend on a regular basis. The last two meetings (2009 and this year) posed special problems for me, since I am also the driver and mule for Amy’s moving trip to Juniata College. The two institutions – CSHL and JC – don’t seem to “talk” to each other, and move-in has been coincident with the meeting (basically, 1 day apart, not enough time to drive to PA, return, and fly to NY). This means that I have ended up driving from Lexington to Cold Spring Harbor for the past two meetings. Load the car up with a dorm room, drive to Huntingdon PA, unload, and just continue to Long Island. Well, it turns out that this was a pretty fortuitous choice of travel this year. The 2011 Eukaryotic mRNA Processing Meeting was, as usual, an exciting and productive one. But it may well be remembered as much for the bookends of the meeting – the eastern seaboard earthquake that ushered the meeting in on the 23rd, and Hurricane Irene, that necessitated some creative re-scheduling of the last day and a half of the meeting. Many participants were busier Friday re-scheduling shuttles and flights than listening to presentations. I was able to leave at the crack of dawn Saturday and beat the storm by about half a day. The bookends aside, the meeting was excellent (as usual). I won’t post specifics here (CSHL has rules about commentary and disclosure that I will give a wide berth to). A few themes do merit mention. One is that polyadenylation and mRNA 3′ end formation was topical this year. This is due largely to studies such as I have discussed here and here. More and more labs have begun to look at alternative polyadenylation in the context of gene regulation and clinical outcomes, and the number of talks and posters that touched on polyadenylation was gratifyingly large. A second theme was one that has been developing for the better part of a decade. It has become apparent that the various chapters in the life of an mRNA are not separated, either in time or space. The connections between the many steps – transcription initiation, elongation, termination, capping, splicing, polyadenylation, transport, translation, etc. – are being revealed in ever more fascinating detail. This was evident throughout the meeting. A third theme was technical. In a nutshell, high-throughput DNA sequencing as applied to RNA has become all the rage. Lots of people are using variations on the themes I describe here and here to study alternative polyadenylation. (I hope to be able to discuss additional plant studies in the near future – stay tuned.) This in addition to other RNA-Seq applications, ChIP-Seq, CLIP-Seq, CRAC (see the brief mention near the bottom of this site), and other acronym-encoded approaches. (I’m kicking myself for missing an opportunity to come up with my own clever term. Oh well.) As sequencing becomes more affordable, I think that this trend will continue. You are currently browsing the archives for the Polyadenylation category.